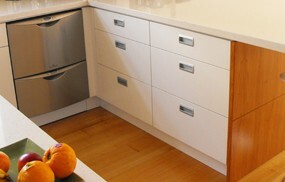 Wellington Custom Kitchens and Bathrooms not only produces stunning new kitchens throughout Wellington - but we also repair and renovate existing kitchens. We have the skill and experience to bring your old existing kitchen into the 21st Century - with either a full kitchen renovation, or with a small kitchen upgrade (that can make a big difference to how your kitchen looks and functions). From upgrading your kitchen to one with contemporary European styles and design, or subtle renovations where new features are added - but with an emphasis on preserving your traditional kitchen look and feel. There really are a myriad of options for kitchen renovations, and we can tailor those options to fit your personal tastes, investment requirements, and budget. Small defects and damage can grow to big problems in kitchen areas where a combination of water and sheer volume of traffic can exacerbate normal day to day wear and tear. 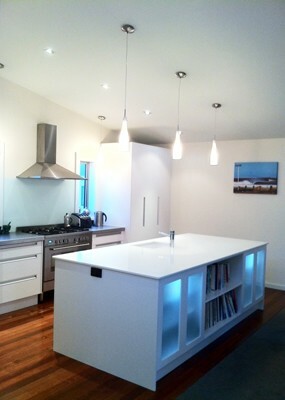 Custom Kitchen and Bathrooms provides kitchen repair services throughout Wellington – with an emphasis on honest advice and solutions. Whether you require new hinges and handles fitted to your existing cabinet doors, or areas created for the placement of new appliances – call us for a free on the spot appraisal. Note - we charge a call-out fee for all small job and repair consultations.